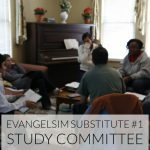 Why does your evangelism committee exist at your church? Is it just another meeting? Does it really fulfill the role of helping the church do the work of evangelism? Recently I’ve been asked to comment on the role of an evangelism committee or evangelism ministry in the local church. 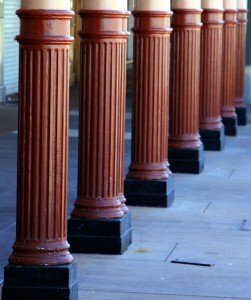 What are the functions of a church evangelism committee? 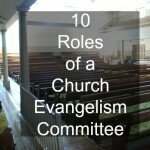 I want to give you ten roles that an evangelism committee can play in a healthy congregation. Today is part two of a series on four substitutes for Evangelism. This may sound funny coming from me, because I write so much on this topic (and even sell two ebooks). But as I’ve consulted with churches, I run into this substitute regularly. In many churches, we have substituted evangelism for the nicety of saying “Hello” at a church on Sunday and we call that evangelism. Many churches have an “Evangelism Committee” that is focused on the church coffee hour and assimilation of newcomers. Some committees are expanded to include church marketing efforts. But Christian hospitality on a Sunday morning is not personal evangelism. Your hospitality ministries support the evangelistic work of the church, but it is not evangelism. Rather, your hospitality creates the space where evangelism can occur, much like Starbucks has created the third space for life conversations to occur. This definition is much broader than evangelism. The potential depths of our relationship with one another. These are entirely different goals. They’re mutually supportive, but they’re not a substitute one for the other. Churches should have hospitality committees that oversee the various welcoming functions of the church, but this work is not personal evangelism. The art of welcoming church visitors is a key component in helping a church fulfill its evangelistic partnership with its members. Your church members should be confident that their invitees will be warmly welcomed in the midst of a group of strangers. Your members should be so proud of the welcome that your church gives that it naturally fosters personal invitations. A hospitality team will oversee all that: reception, greeters and tweaking the system to leave your guests feeling like that they’ve had a great visit. Your hospitality committee should do at least a quarterly review of your church hospitality systems. 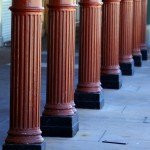 What is the actual role of your church’s evangelism committee? How can your committee take a more active role in encouraging personal evangelism in the church? 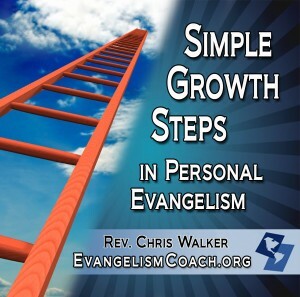 Each week, I send out new articles to help you grow your your skills in personal evangelism. I include other articles as well on hospitality ministry, greeter ministry and refreshing your vision for church hospitality. Today I read a post at 9 Marks about the corporate role of the church and its support of personal evangelism. What is the role of the local church (i.e., corporate witness) in our personal evangelism (i.e., individual, personal witness)? Consider the ethos of your church. Are you proud to invite a non-christian to attend one of your services? Do you love your local church? Does your church help you share your faith? Does your church support the work of personal evangelism? Let me give you two examples from my life, one good, another one not so good. 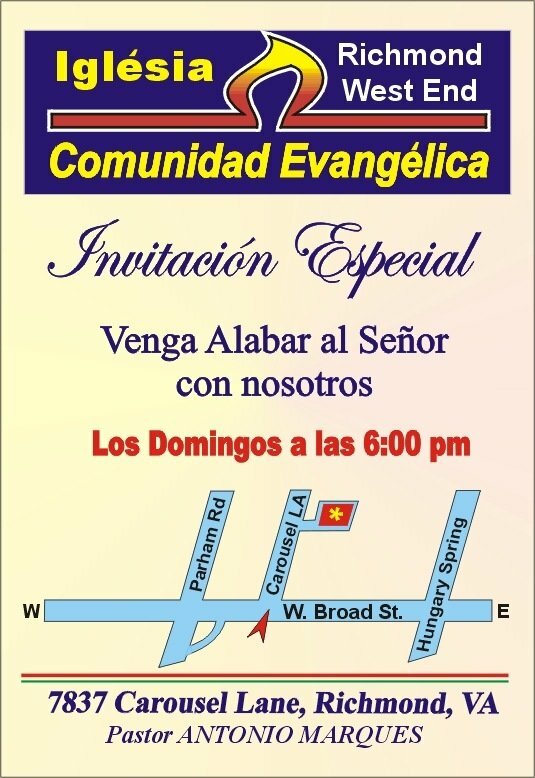 We attended a little Spanish language church for the last 8 months that welcomed us with open arms. We were adopted quickly by that church family and it was hard to leave when we moved. During my 8 months there, I was always telling people about my church. Everybody knew where we were going to church. I had these little invitation cards written in Spanish that I could give to people. I knew that my church often explains the gospel as part of every service. I would give away 10 or so a week to people that I met on the street. The church provided the invitation cards, showed us how to use them, and we used them. The church has grown with people finding faith and joining. The church supported our personal witness and we were proud to invite people to our church. On another occasion, I was embarrassed to invite my unchurched friends to a church I loved and served. It was very inward focused and did its own good in its own way, but it was clearly geared towards mature Christians. We were having a larger number of unchurched people attend our evening service. I was preaching simple biblical messages, and we were providing space for people to explore their faith. People were beginning to belong and build relationships. Then they attended a morning service with the “normal” church. Almost every time, the sermons were inappropriate for people seeking faith. The sermons were for mature Christians. The sermons were not relevant. I can’t go into the details, but it killed every relationship that had been forming. Every seeker from our evening service who went to the morning service never returned to our church. I stopped inviting people to my church. I also never invited my friends to retreats, because the topics were for mature Christians. I never invited my friends to the morning service because I was never sure what Pastor would ruminate on. Please don’t misunderstand me. My pastor taught good stuff. Excellent stuff, but for mature Christians. This church didn’t have an ethos that supported my work of personal evangelism. Work to find ways to support evangelism in your local church. Can you think of someone you could invite to your church this weekend?